This vibrant AllSaints shoulder bag with a clean-cut shape, edgy hardware and wide strap, is a classic go-to. 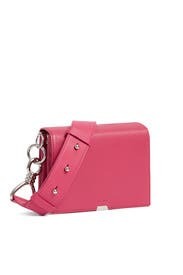 Fuchsia smooth leather structured shoulder strap with foldover magnetic closure. Leather adjustable strap. 5.12"H x 7.5"W x 2.76"D.